Every Monday, Cathy at Rambling in the garden shares her best blooms with gardeners around the world. My contribution was collected quickly from the garden on a very wet bank holiday Monday. The huge clematis blooms were irresistible, they are rambling through the weigela, and it looks like they are Clematis ‘Ines’ and ‘Nioble’ which sounds rather like an obscure Shakespearean romance. I’ve used a little garden wire to support their droopy heads, just visible in the image below. 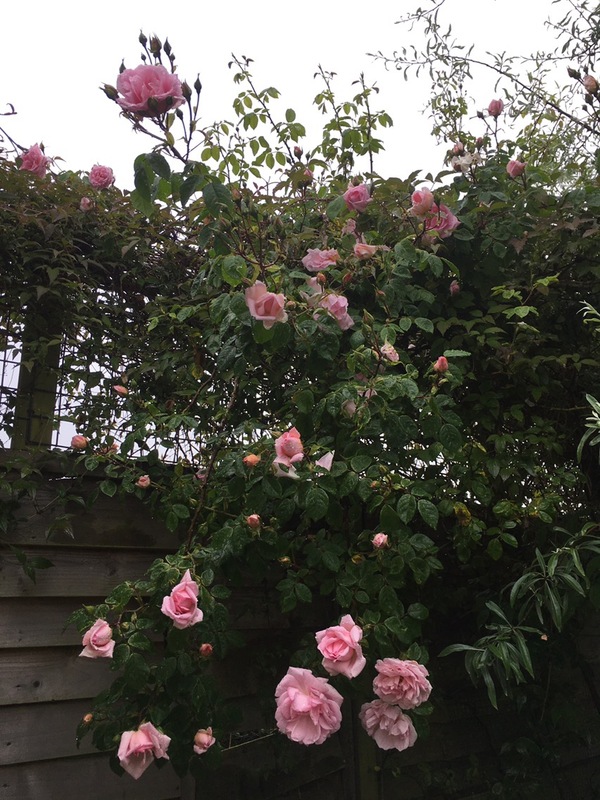 The peach rose is one that I bought about 15 years ago at Woolworths as a bare root bargain, and it’s moved with me from garden to garden ever since. It is the first of the roses I brought from our last house to come into flower, and it’s a lovely soft peach colour with a wonderfully sweet and fruity aroma. I’d be delighted if anyone knows this variety, it seems to resemble one called Warm Wishes but I’ve long lost the label so can’t be sure. From the top, we have ‘warm wishes’ and pink rose, clematis Niobe, clematis Ines, Dahlia, snapdragon, canterbury bells, red valerian, and another pink rose. Sorry I can’t be more informative with the varieties! The mystery rose is abundant, whatever it is! If you’re in Frome next Sunday, please pop by and say hi! What a pretty mix of flowers! The vase is perfect with them too. Beautiful vase full of flowers. Loved seeing/hearing the rain and birds too. 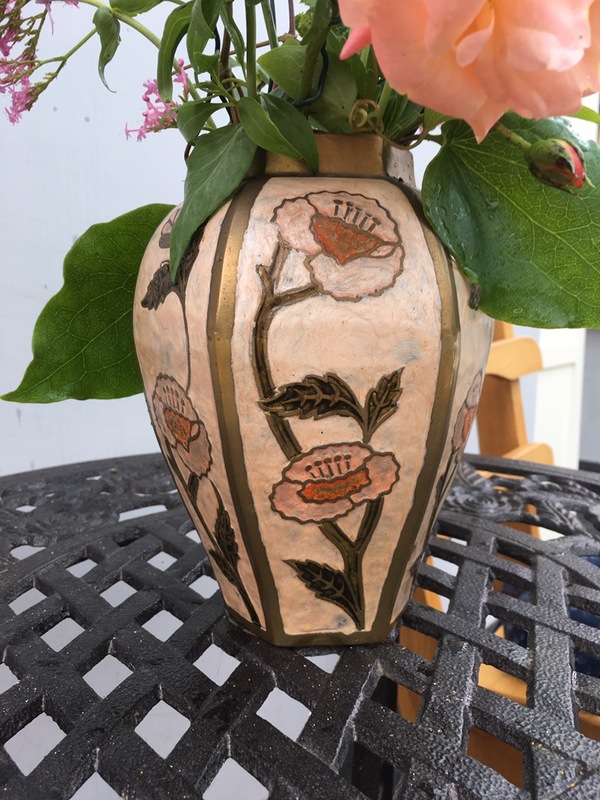 I love your new vase – a good match for the peachy rose. 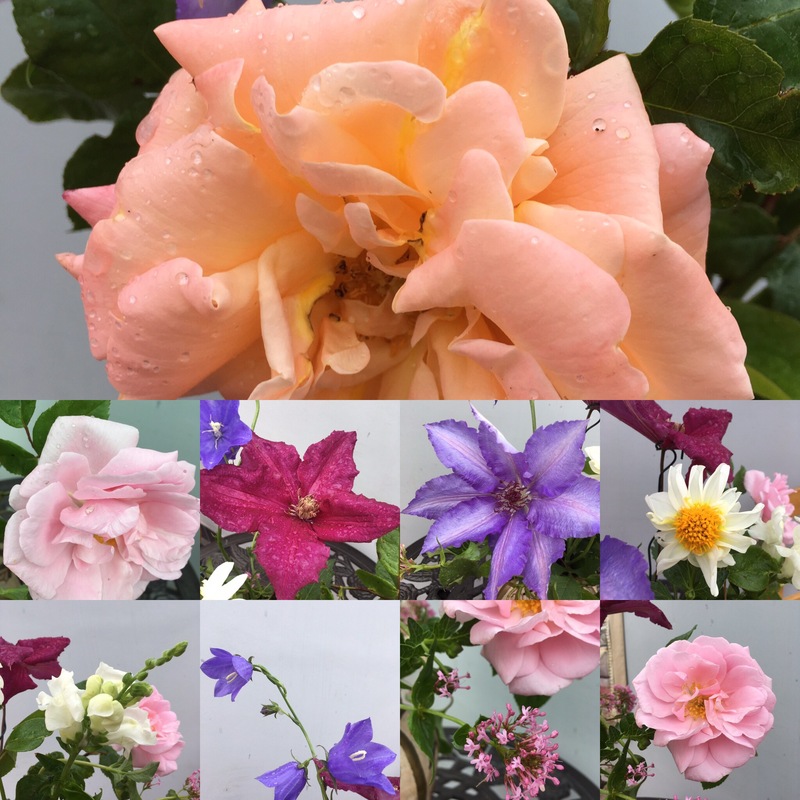 Clematis and roses – things are blooming well in your garden!